In 2016, a Wisconsin cheese took home the title of Grand Champion in the World Championpionship Cheese Contest for the first time since 1988. This cheese was Roth’s Grand Cru Surchoix, a creamy and nutty Alpine-style cheese that melts just as beautifully as it fits on a cheese plate. 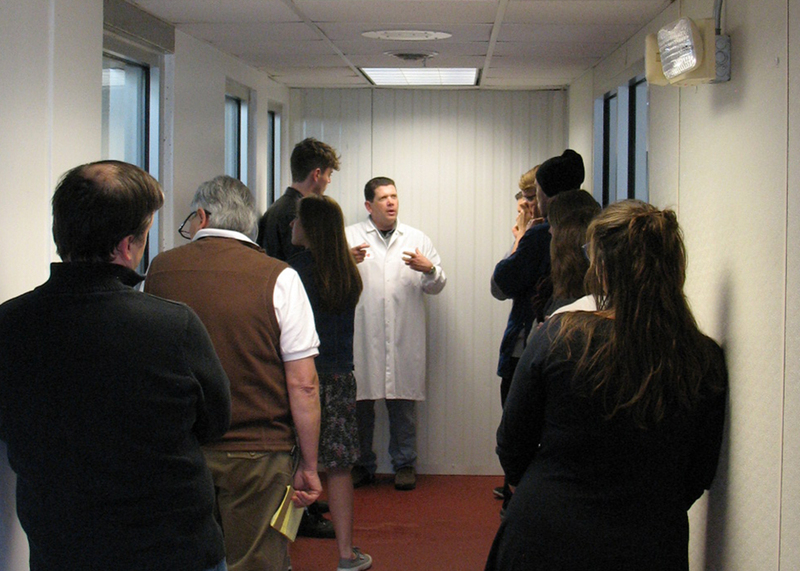 Our cheese mongers were able to visit Roth this May to see the dedication it takes to make a World Champion, as well as dozens of other quality cheeses. The Roth Creamery is located in Monroe, where it opened as Roth Käse USA in 1991. Roth, which has Swiss origins dating back to Oswald Roth’s 1863 cheese company, still specializes in cheese made in the Alpine tradition – as its Grand Cru Surchoix demonstrates – though that is not to discount the innovation taking place in Monroe. Much of our time at Roth was spent tasting their cheeses, from GranQueso Original (which is great with honey, by the way!) to the raw-milk Buttermilk Blue. It quickly became apparent just how much thought Roth devotes to how its cheese taste. Our hosts not only focused on how the cheesemakers crafted the most delicious product possible, but were rife with suggestions about how to best pair their cheeses for the fullest tasting experience. What was especially exciting during our visit to Roth was the news that the company is now producing a line of organic cheeses, including organic versions of their classic Havartis and Grand Cru original. What this meant for the cheesemakers, who still make each artisan cheese by hand, was greater diligence: the organic cheeses, made with locally-sourced milk, were made using equipment that had not yet touched the milk of other cheeses. After tasting Roth’s Organic Sharp Cheddar, our cheesemongers can guarantee the deliciousness of the final product, as well as the significance of such a well-known producer branching out into organic dairy. This entry was posted by Kyle Richmond in News & Announcements.